(CNS): A delegation of various representatives from the United States Embassy in Kingston, Jamaica paid a visit for the first time to the Cayman Islands recently to offer information to the country’s American citizens. As an overseas territory Cayman does not host any international embassies or high commissions as they are located in London. However, Cayman is home to a number of US citizens whose nearest embassy is in Jamaica and as a result the visit facilitated by theDeputy Governor’s office, which holds responsibility for consular matters, gave them a chance to ask questions and seek information without travelling to Kingston. The town-hall style public meeting was held at the Marriott Grand Cayman Beach Resort when the US Embassy officials explained who they were and what they did. “ This is the first Cayman meeting with citizens – which is long overdue,” said David Stone, who is the American Consul General in Kingston. He explained to the audience the role of his office, especially in relation to the Cayman Islands. Stone said consular services include registering US Citizens who live in this region, voting issues, as well as processing passport and immigrant and non-immigrant visa applications. Another service is providing country information for the benefit of travelers. An important embassy service, immigration, is the responsibility of Adijatu Abiose. She is the Citizenship and Immigration Services Attaché with the Department of Homeland Security in Jamaica. Her office’s email address is: jamaica.uscis@dhs.gov. The US citizens were told that submitting immigration applications to the USCIS offices at the US Embassy in Kingston will expedite processing. Her colleague, Lee Marple the American Embassy’s Regional Security Officer explained that his office assesses threats and vulnerabilities that relate to the United States and its citizens. In so doing, it works closely with the Royal Cayman Islands Polcie. “The Cayman Islands rate as ‘low’ for crime and terrorism in the security rating of the region,” he noted. Marple explained that the US Embassy has emergency preparedness plans in place for scenarios ranging from hurricanes to acts of terrorism. He emphasized that the embassy provides citizens with information and support (such as evacuation) before and after emergencies, but it may be difficult following disaster situations depending on the type of emergency. In the Cayman Islands, the Ritz Carlton Grand Cayman is the official gathering place for U.S. citizens in the case of a declared emergency or evacuation. Jane McEntee, is the Social Security Administration (SSA) Field Officer, and is based in San Jose, Costa Rica. She is also the regional Federal Benefits Officer and oversees all 49 posts south of the United States. She told attendees that the SSA’s Federal Benefits Unit in Jamaica serves the needs of U.S. citizens living in Cayman and in Trinidad and Tobago. To access these services, log on to www.socialsecurity.gov, or fbu.jamaica@ssa.gov. The phone numbers are (876) 702-6043/6006. 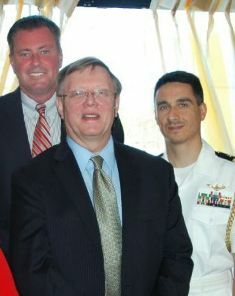 Captain Dom Micillo, United States Navy, US Defense Attaché in Kingston represents all the American armed services and deals with issues relating to veterans, as well as processing applications for US military academies. His section works closely with the Jamaican Defense Force and with Cayman authorities in relation to security issues. Dee Duggan serves as the US consular agent in the Cayman Islands. This Consular Agency does not offer a full range of consular services, but processes and forwards documents to the US Embassy in Jamaica and provides information as well as notarial services. The Consular Agency is located at the Cayman Centre, adjacent to the Airport Post Office, and is open to the public on Mondays, Wednesdays and Fridays, from 8a.m. to 2p.m., and Tuesdays and Thursdays until 1p.m. The office can be reached by phone at 945-8173, or by e-mail at: consagency@candw.ky. The US Embassy’s number in Kingston is (876) 702-6000.